Walt Disney Co. said Thursday it had reached a deal to buy 21st Century Fox for $52.4 billion (44.3 billion euros) in stock, solidifying its position as a producer of entertainment content as it faces new rivals from Silicon Valley. 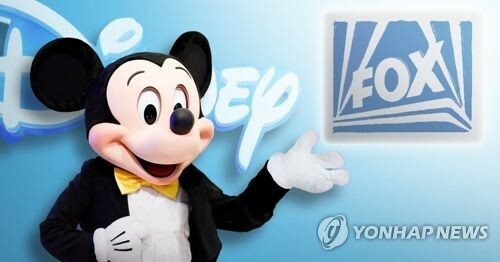 The deal will see Disney acquire film and television studios, cable entertainment networks and international TV businesses, bringing popular entertainment properties including X-Men, Avatar, The Simpsons, FX Networks and National Geographic into Disney's portfolio. 21st Century Fox's television stations and Fox News channel will be spun off before the sale, however. "The acquisition of this stellar collection of businesses from 21st Century Fox reflects the increasing consumer demand for a rich diversity of entertainment experiences that are more compelling, accessible and convenient than ever before," said Disney's chief executive Robert Iger in a statement. Disney has been seen as trying to bolster its Hollywood and television positions by getting the Fox library of content to strengthen its arsenal against Netflix and other rivals. Disney, which owns the ABC television network, ESPN and has major studios in Hollywood, is set to launch its own streaming services aimed at competing against Netflix and Amazon. The deal also gives it a controlling interest in Hulu, another popular streaming service. The news comes as another major media deal, between AT&T and Time Warner, has been challenged in an antitrust filing by the US Justice Department. Prior to the deal going through 21st Century Fox will transfer the Fox Broadcasting network and stations, Fox News Channel, Fox Business Network, FS1, FS2 and Big Ten Network into a newly listed company that will be spun off to its shareholders.